When Dave Allen left Gang Of Four for the less sunny climes of Shriekback, many wondered how the mothership was going to fare. By the evidence of this album, it had every reason to expect continued growth and possibly greater success. 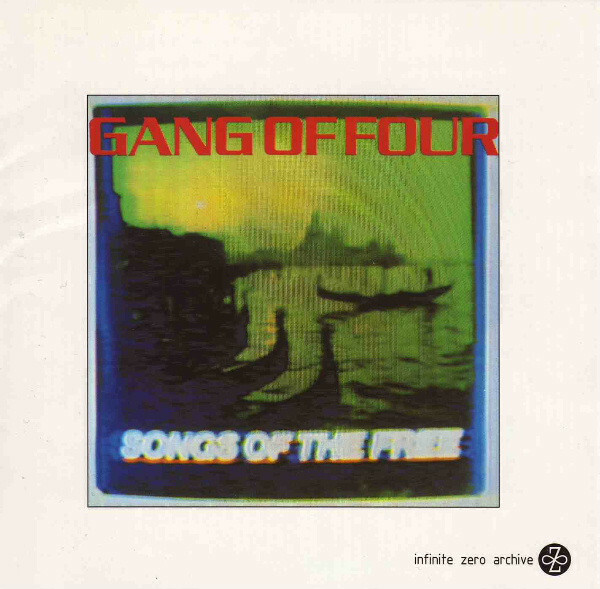 The third Gang of Four album featured new recruit Sara Lee [ex-League Of Gentlemen] adding the jagged and brusque bass ganks we had come to know and love by that time. The biggest change was in bringing in co-producer Mike Howlett to add some commercial potential to the mix. “Call Me Up” assured listeners that they could still depend of Gang Of Four for a Post-Punk funk shot full Marxist theory. Andy Gill’s howling metallic guitar still sounded like a wounded beast but the drum track sounded like explosions on the dancefloor. The vocals of Jon King were still high and strident; offset occasionally by the deep undertow of Andy Gill’s contrapuntal vocal harmonies. It almost gelled as dance music but was fundamentally too left field to be accused of pandering. The first single, “I Love A Man In A Uniform,” was the furthest thing from pandering, coming as it did on the heels of the Falklands War which undoubtedly saw its message banned from the restrictive BBC wartime playlists of the time. The lyric relentlessly mocked militarism, patriarchal roles, and rugged individualism over a beat of drums so gated that they sounded like gunfire; appropriate, in this context. For a change. It was a lurching, tech funk monster that actually reached the Top 30 on the Billboard dance charts. Joy Yates backing vocals added deeply ironic soul to this number. The tightly coiled funk riffing of Gill coupled with the booming backbeat of Hugo Burnham’s drums would seem to leave little room for vocalizing. For once, the metallic shriek of Gill’s guitar met its match in the ragged vocals of King, who dominated the cut by vacillating between falsetto singing and going into the red with his performance. As the song ended, all of the other instruments dropped out of the mix, leaving King alone to finish singing the chorus at full volume. After that moment of maximum impact, the album delivered its masterstroke with the subtle polyrhythms of “Life! It’s A Shame.” Burnham’s drums kept a steady, droning rhythm abetted by interjected bass gank’s from Sara Lee. Burnham’s fills in doubletime were building a massive patina of complexity to it all. With Gill adding his bass contrapuntal vocals and some torn metal guitar over the top reaches a kind of Post-Punk nirvana here. The whole track had a clockwork balance that was a n example of perfection in arranging in dense layers of sound with every element in perfect alignment with the other factors in the mix. “I Will Be A Good Boy” had a strong dub reggae vibe with a loose, airy mix with King playing melodica; always a sign of Agustus Pablo influence. King and Gill shared the vocals on this one with Gill dominant for once. The album proper ended with the subtle foreboding of “Of The Instant,” which crept through the night, keeping hidden in the shadows as it asked “who owns what you do – who owns what you use?” The normally slamming rhythms of Burnham were nowhere to be found this time. The bonus tracks were the “Uniform” UK B-side “The World At Fault” with the US dub mix of “I Love A Man In A Uniform.” The former was a slow tempo funk burner with another anguished King vocal giving it his all. The latter was a true dub mix of the single with dubbed out vocals and a maximal approach to reconstructing the track; now filled with clattering beatbox that sounded like military drums. The brief album [45 minutes with two bonus tracks] took great strides in assigning a smoothness to what was a fundamentally rough and even harsh band. The big beat drums were employed here to round off some of their sharper edges, while the complexity of the arrangements kept it all from going down too easily. If Mike Howlett was the guy who could take OMD into the Top 20 and jump start their career, I can see the thought in getting him to add his production savvy to the GO4 mix. The album listens very well and invited replay once it was over. I now have two of the first three “classic” Gang of Four albums. I need to get “Entertainment!” and would be willing to give “Hard” a listen before perhaps venturing further afield. This entry was posted in Record Review and tagged 1982, 1996, Gang Of Four, Songs Of The Free. Bookmark the permalink. This album doesn’t get enough love. A lot of Go4 purists and/or snobs hate on anything this band did after Solid Gold, but I think that Songs of the Free is a really good record. This Infinite Zero remaster has some problems though: it is brickwalled to death (as was the case with most of the IZ catalog) and is missing the other (non-dub) 12″ mix of “I Love A Man In A Uniform”, plus the genius B-side “Producer”, which ranks as one of my all-time fave G4 tunes. Now, the follow-up, Hard, well… there are a handful of good tunes there, and even one or two Go4 classics, if we want to be charitable (I’ll give props to “Silver Lining”), but the string synths, disco beats, and programmed drums just don’t work for this band. But, Monk, you simply must get hep to Entertainment. I rate it as being one of the top five most essential post-punk albums, period. As a mission statement, it defines everything post-punk stands for, and there isn’t a bad cut on it. JT – Usually, when a label licenses a master from the US [the US order of tracks is used here on the IZ RM] that means that they would have access to the US label’s materials. But instead of “Producer” and the 12″ remix of “Uniform” they mixed up the bonus tracks from the UK B-side [never before released in America, if I’m correct] and the US dub mix. Very atypical. 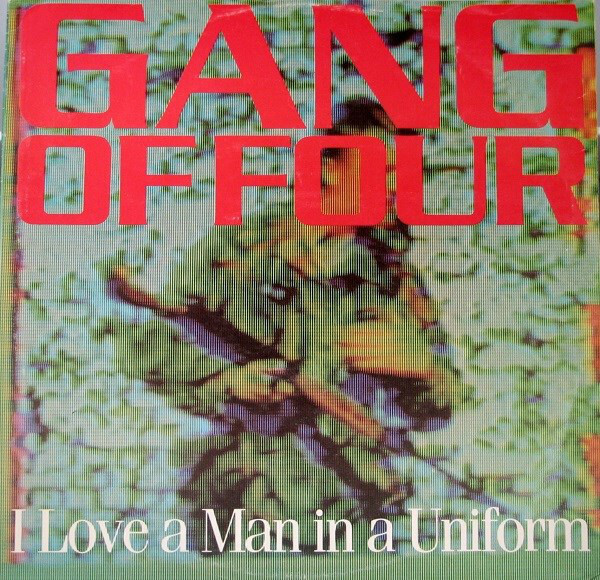 I have always thought that Songs Of The Free to be Gang Of Four’s most universal album. There may be some 80s musical tropes, but the album is timelessly urgent and politically angry. The album also contains one of my all time favorite song titles – We Live As We Dream, Alone. It’s funny I’m sure at the time the critical reaction to this album was very mixed, which probably says more about the prejudices of the time than the actual quality of the record. I bought Hard when it came out and did enjoy it but it is a step down. I’ve loved all the tracks from SOTF I have on compilations but have never actually got the album itself, another for the list. I have a very deep affection for Hard. 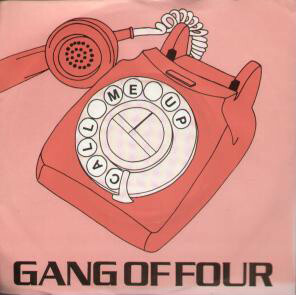 To be honest there’s only one album by Gang Of Four that I don’t care for much, but that’s for another time. What I love about Hard is the overtness of the concept. It’s Political Disco, Political Funk. It is full of Go4 urgency. It trades in Go4 jagged guitars and throbbing bass. If I have one larger critique, it’s in the production. I’m not sure what the team of Howard and Ron Albert brought to the table with a Folk and Southern Rock background. The Productions is restrained, inhibiting the potential impact of some of the tracks. Agree, the songs are good, production weak. Critics at the time were not welcoming of songs like Is It Love, for 17 year old me songs like that fit in well with the kind of post punk new pop I was loving. Am intrigued which album you don’t like…I’m going to guess maybe Mall. Simon – you are close. Mall took some getting used to, but now I feel it is a really good “comeback” record. Speaking of comeback records, and most bands don’t get more than one, but 2011’s Content is among the band’s best albums. It acts like a tear in the fabric of time – taking Jon King and Andy Gill, well into their 50s at the time and throwing them back 30+ years in musical and political attitude while sounding current and vibrant. The album that just leaves me disappointed is 2015’s What Happen’s Next. It doesn’t carry any of the promise of Content and for my ears, Jon King is sorely missed. This year’s singles Ivanka (Things You Can’t Have) and Lucky were a welcome return to form. Funny I had actually forgotten that one! Agree Content is brilliant. Managed to see a couple of the reformation gigs, have seen few better. I’m guessing you may have been lucky enough to see them first time round? Indeed, I have 5 Gang of Four tours under my belt. The first two was at Club 57 in 1979/80, then The Ritz in 81, Peppermint Lounge and Avery Fisher Hall for the Songs Of The Free Tour in 82, 83 at Hofstra University for the Hard Tour and finally for the “Farewell” tour featuring songs from Hard in 84 on the “Farewell” tour. I wish I had gotten to see them on the Content tour. That album just floored me. SimonH – Never in a million years in Florida! All I’m saying. Nice write up on a great album – crying out for a more comprehensive reissue on CD gathering a few more ‘of the era’ tracks – in the meantime a few of them can be found on CD on the ‘100 Flowers Bloom’ compilation (Producer, I Love A Man In Uniform US 12” Remix, I Will Be A Good Boy (Demo)), still missing in action other than its original Vinyl magazine flexidisc release is Lord Make Me A Cowboy, as are the 7” edit and UK 12” Long Version, I think? ‘Producer’is a particularly fine little number – I also like how Andy Gill’s guitar work on the last track on the album, ‘Of The Instant’, is like a slow motion shadow version of ‘I Love a Man in Uniform’. iac4ad – Welcome to the comments! I knew about the missing US “Uniform” 12″ tracks but not the others of which you spoke. I bought an LP of this one in the 90s and must have listened to it more than once since I remembered most of the songs when playing this CD. That is rare for me. How many times have I bought vinyl and left it on the racks awaiting a digitizations that rarely happens?